An interesting statement from their press release, in that the new company will market itself to businesses desiring turnkey solutions. Sportech is well versed in operating B2B aggregated network operations, as the core of their business up until now was providing the same services to regulated gaming markets. Based out of London, they oversee betting operations in 30 countries dealing mainly in wagering technology, licensing their software and expertise for both sports and horse betting. One can assume the new company intends to utilize Sportech’s large customer portfolio, while pushing their licensed DraftDay software into a market that is as yet untapped. 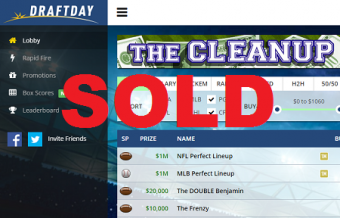 Up until now, all daily fantasy sites use proprietary software unique to their websites. With the formation of the DraftDay Gaming Group, and the intention to license their software to other companies, the amount of players in the daily fantasy operators market could grow drastically in the coming year. A great day for the daily fantasy consumer, as by all accounts their options will grow exponentially in the coming year. Should the DraftDay Gaming Group use a pool system, sharing entries amongst the sites in their network, would allow the company to promote and run the large GPP’s that appear key to industry survival. For their own product, which the apparently still intend to run, the addition of Viggle to the ownership group is an exciting development. Operating an entertainment marketing and and rewards platform, whose app reaches 23.6 million people per month, Viggle is positioned well to successfully market the DraftDay to their own clientele.